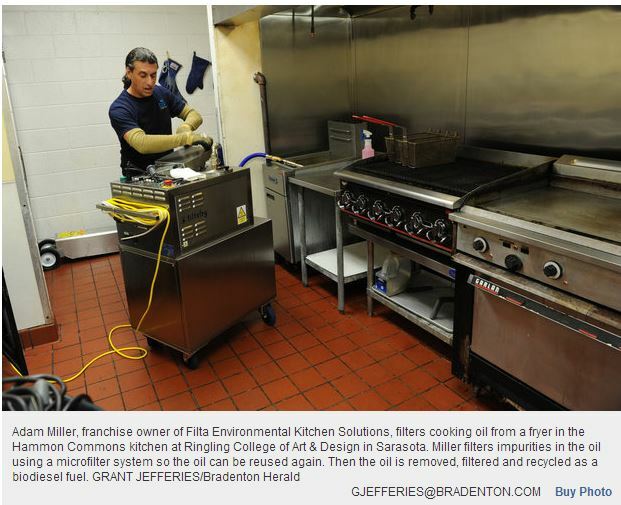 Adam Miller is willing to get dirty and use elbow grease to benefit the environment, a huge selling point for his new franchise, Filta Environmental Kitchen Solutions. The best selling tool for his Filta franchise may just be his offer to come into commercial kitchens and take on the task of cleaning the fry vats. Miller cleans the cooking oil to extend the life of the good oil, removes the waste oil and ships it to be converted into biodiesel fuel. It’s a dirty job and “nobody likes doing it, but what I love about it is I know that I’m giving service to the customers that is very helpful, that is green, and that is good for the environment,” Miller said. franchise rights to Manatee, Sarasota, Charlotte and DeSoto counties. Manatee Memorial serves 2,500 meals a day, so Miller services their fryer twice a week. Before contracting with Filta the hospital used to store barrels of oil on the loading dock. Formerly a manager with Wolfgang Puck Restaurants in California, Miller decided to become an entrepreneur after working as the regional manager here for Eager Beaver Car Washes. He had heard about Filta during his time in the food service industry. His experience also allows him to move around a kitchen with ease. The smaller kitchen at Polo Grill and Bar in Lakewood Ranch utilizes Miller’s services and he has helped save them money on oil. And having someone come in and handle the messy oil vats seems to be a huge draw. “It’s extra cleaning, relatively inexpensive compared to the cost of oil, and he takes it away for us at the end,” said Terry Pajka, manager of concessions for the Pittsburgh Pirates. “It’s a messy process, usually. It stinks. It’s not very attractive, Storage filters are always messy and ugly, People only want to come pick it up when you have like four vats of it. When it’s time to come out, he just comes and takes it. “He’s very flexible, and obviously honest too, He came for our scheduled treatment and saw our oil didn’t need to be treated so he didn’t do it. I highly recommend him. It’s one less thing you don’t need to worry about,” Pajka said.